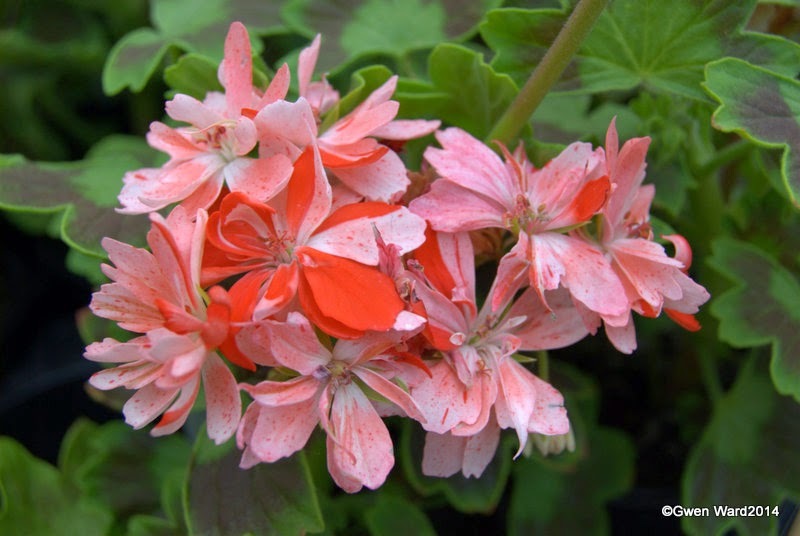 Single zonal pelargonium "Beauty of Caulderdale"
Of all the red pelargoniums, this single pelargonium has, I think, the softest bright red. She certainly lives up to her name of "Beauty of Caulderdale". The light green leaves are well zoned and contrast nicely with the red flowers. A strong grower which flowers profusely. "Beauty of Caulderdale" was introduced by Cannell in 1868. 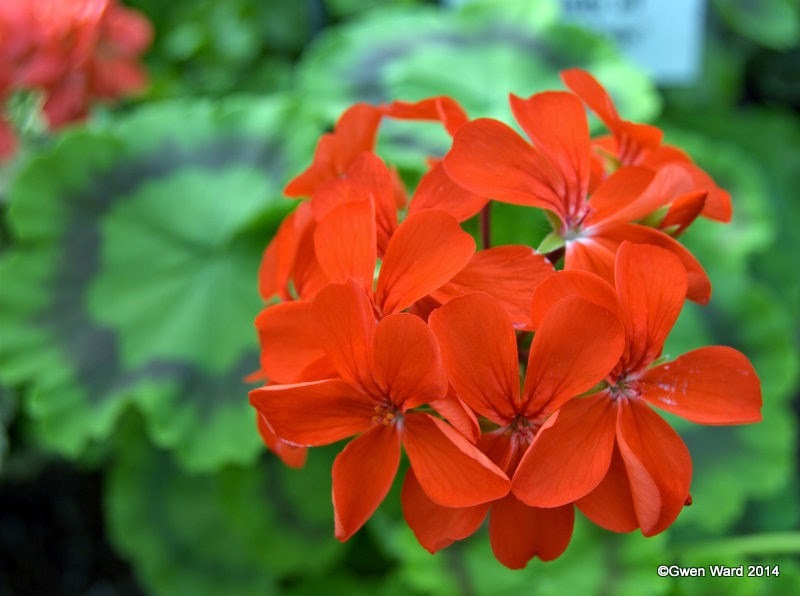 Photograph taken at Fibrex Nurseries- home of The National Collection of Pelargoniums. 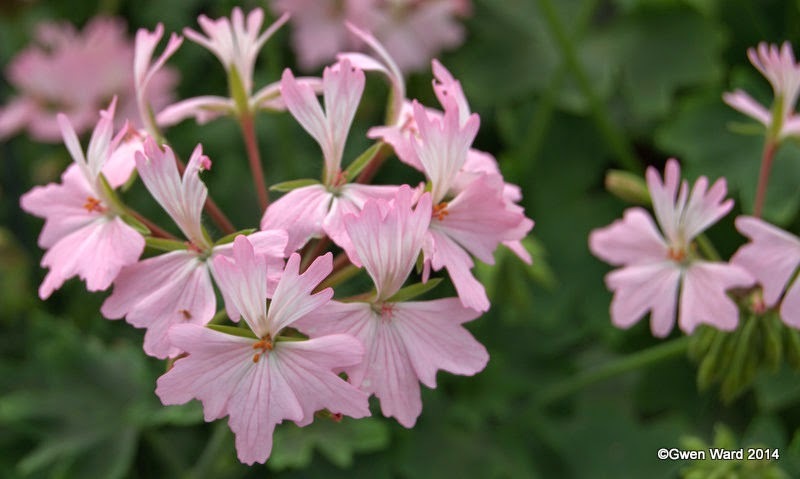 Another stellar pelargonium from the late Brian West, “Newchurch” has single pink flowers with the top two fading to paler pink in the centre of the petals. 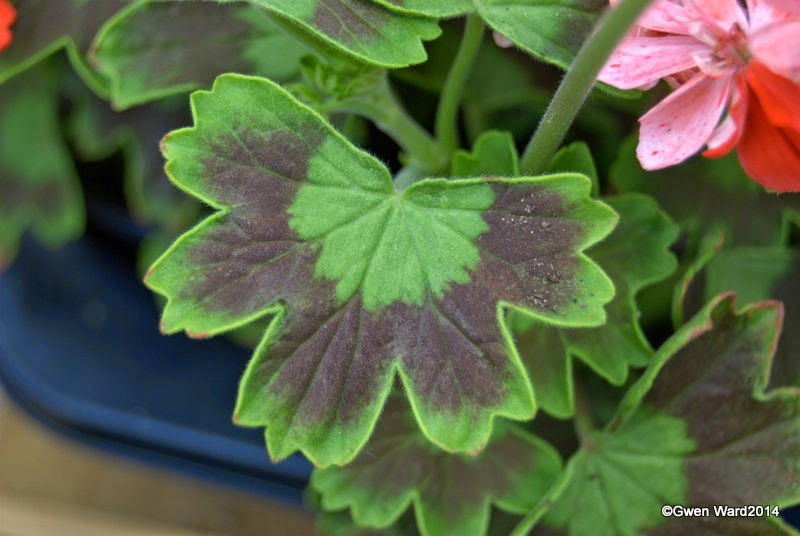 The leaves have a large dark bronze blotch. "Newchurch" is a cross between Dunnose and Lotusland and was introduced through Warrenorth Nursery. As he did with many of his raisings, Brian named this after a village on the Isle of Wight. 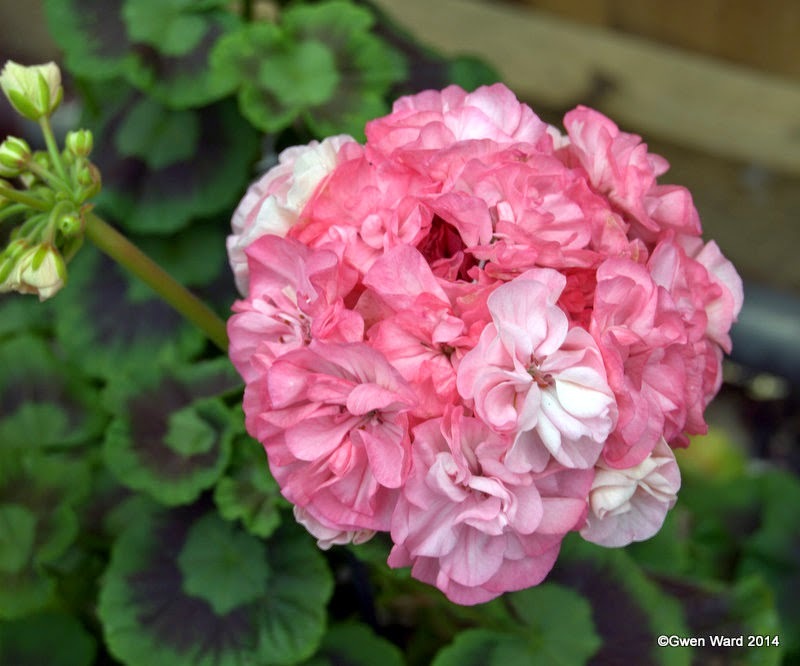 Wordless Wednesday - 11/02/15 - Angel Pelargonium "Carlos"
Zoe Kathleen is another stellar from the late Brian West. 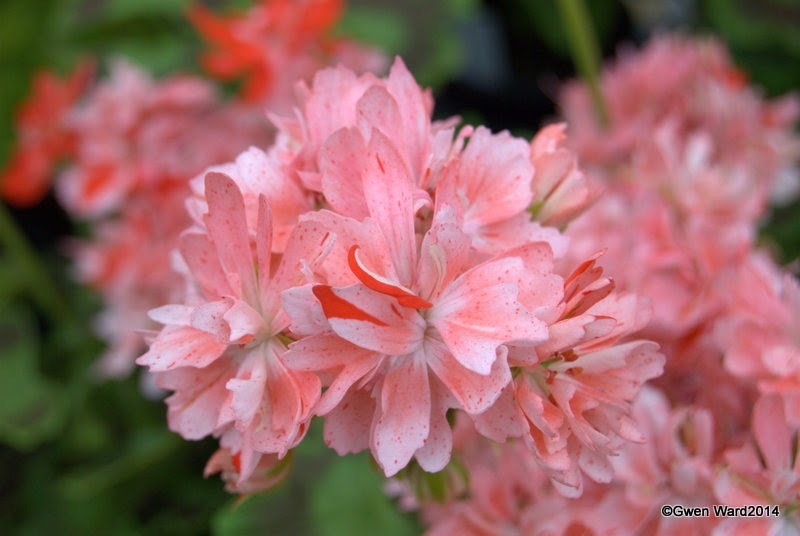 This is a double stellar with pink petals speckled and splashed in red. The leaves green with a broad dark zone. 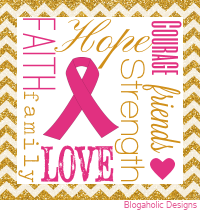 Zoe Kathleen is a cross between Nippert and Vectis Glitter. 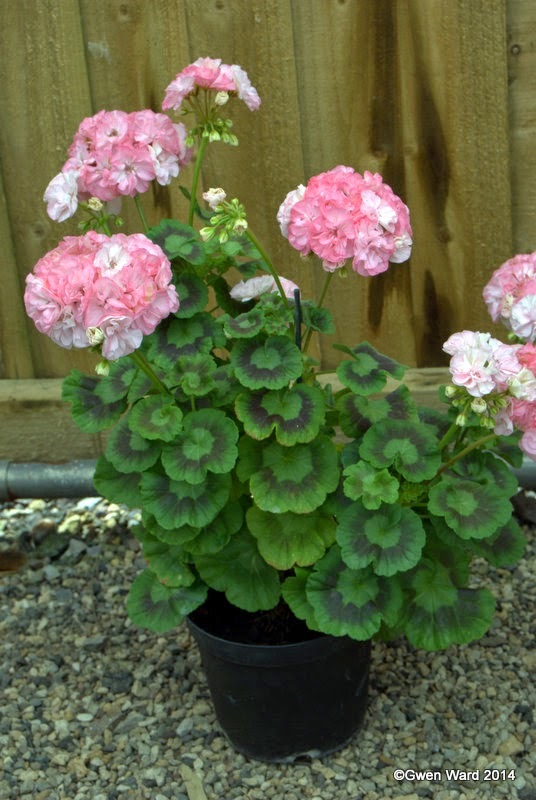 Each year at the Farnborough Fuchsia & Pelargonium Society we are able to purchase for £1 a pelargonium cutting (or two) to grow on and put in the Annual Pelargonium Show. This year our cutting is a species. We are never told the name of the plant so that we don’t either buy another plant if we lose ours, or grow on one we already have (as if anyone would!). 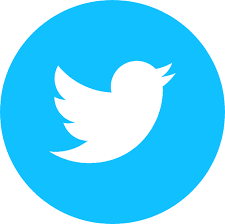 I have a pretty good idea of what it is, and as we go on I am sure you will too. As I was unable to get to the last meeting at Farnborough our Chairman, Steve, very kindly brought my cuttings to another meeting we both attended. I thought it would be interesting to record here how my cuttings grow – so here is a photo of the cuttings before being potted up. They are in 2 1/2" pots and now in 3" pots, but look pretty much the same still. I hope to update this here and let you know how I get on at the Show in June.